Mister God, This Is Anna is the story of a young girl’s conversations with Fynn, a nineteen-year-old living in London’s East End in the 1930s. The conversations are full of questions Anna asks about life and God and they normally end up with her giving her own answers with a strange, anarchical yet down-to-earth common sense. It’s not clear how autobiographical the book is – its author, Sydney Hopkins, describes how he finds Anna and unable to find out where she came from, takes her home only to discover she is an abused runaway. But whether the wisdom really comes from the mouth of a child who’s four when they meet and seven when she dies, or from the imagination of Sydney Hopkins, it is always challenging, insightful and, as we would say now, from the left field. 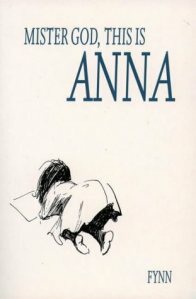 The sequels of Mister God, This Is Anna are Anna’s Book (1986), and Anna and the Black Knight (1990).